After enduring a three game by the St. Louis Cardinals last week and falling a game behind them in the NL Central standings, the Reds faced the Florida Marlins over the weekend desperately needing a surge. Outscoring them 14-6, Cincinnati swept the Marlins during a three game set and reclaimed sole possession of first-place in the NL Central. The St. Louis Cardinals hosted the Chicago Cubs over the weekend and lost the final two games of the series after defeating the Cubs on Friday. 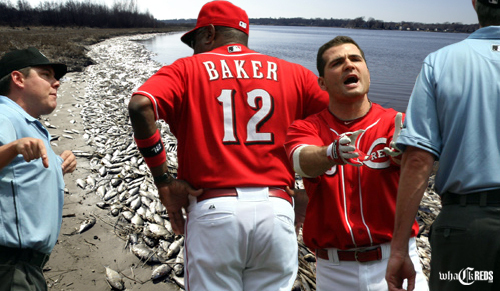 Despite the concerns of many fans, the Reds' 2010 season is far from over. On Friday, Edinson Volquez made his sixth start of the season and received his third win (3-1, 4.25). Volquez pitched six innings and allowed just one run on eight hits while striking out five. After walking at least four batters a game during his last four starts, Volquez walked just two Marlins on Friday. "I think every time I pitch," Volquez said. "I get into a better rhythm...more comfortable." Scoring just eight runs against the Cardinals in three games, the Reds offense recuperated quickly scoring seven times against the Marlins on Friday. Scott Rolen notched three hits (2 RBI) as Brandon Phillips, Laynce Nix, Joey Votto, and Jay Bruce all collected two. Along with his first long ball since June 30, Jay Bruce drove in three runs for the first time since the Reds' 12-2 victory over the Astros on May 29 and has already matched his RBI total for July (5). Florida starter Josh Johnson (10-5, 2.27) was lit up in 3.2 innings of work allowing a season-high in hits (10) and runs (6). Marlins' rookie Mike Stanton was responsible for both of Florida's runs with two solo homeruns. The Reds beat the Marlins 7-2. Facing the Florida Marlins for the fist time in his career and coming off a terrible last outing against the Cardinals (3.2IP, 9H, 7ER), Mike "Godzilla" Leake (8-4, 3.78) got it done on Saturday. Leake hurled six innings and allowed three earned runs on six hits while striking out six Marlins. Scott Rolen, Drew Stubbs, Ramon Hernandez, Paul Janish, and Mike Leake drove in a run each displaying the Reds' scattered offensive depth during the Reds 5-4 victory. With the win and a Cardinals loss, the Reds slid back into a tie for first place in the NL Central. "I give the Reds credit," Marlins' outfielder Cody Ross said. "They're not running slop out there. They pitch well, play great defense. Brandon Phillips is everywhere. I hit to the right, he's there. I hit the ball up the middle he's there. They must have the perfect scouting report on us." With Johnny Cueto currently serving a 7-game suspension for his part in the Reds/Cards brawl last Tuesday, Homer Bailey (2-2, 4.92) made his first start for the Reds since May 23 on Sunday. Juan Francisco was optioned to Louisville to make room for Bailey on the Reds' roster. After a successful rehab stint in Louisville (19IP, 5ER, 15K), Bailey hurled six innings of scoreless ball allowing just three hits while striking out four Marlins. Giving Scott Rolen the day off, Miguel Cairo supplied the Reds with two runs with his fourth homerun of the season during the sixth inning. Anibal Sanchez pitched well for the Marlins (6IP, 5H, 2ER, 7K), but received the loss as the Reds completed a three-game sweep with a 2-0 victory over Florida. "That's a reverse sweep," Dusty Baker said. "That's what we talked about before this series started. That's a quality team over there. They've got some dynamite hitters, some good pitching and they're going to be good for a long time. We held their offense down today pretty much, which is a hard thing to do." Reds' closer Francisco Cordero (3-4, 4.05) notched his 31st and 32nd save of the season during the series. Walking three batters while allowing one earned run on two hits in his two innings of work, Cordero remains problematic as Dusty Baker's terminator. "I have to stop walking people," Cordero said. "I've got to do that or it's going to be like that every time. I see how upset the fans are with me. I understand that. Every time I walk someone, that guy comes in to score. It's not like I'm giving up a lot of base hits. It's walks. I really don't know what to say about that. It's not my style. It's not me. I've never been like that my whole career. I have to keep working and try to be better every time out." Aside from Cordero, Reds' relievers continued to pitch honorably during the Marlins series. Allowing seven hits during seven innings of work, the Reds' bullpen combined for just one earned run while striking out six. The Reds and Cardinals are both off Monday. The Cardinals will begin a two game series against the Brewers on Tuesday, followed by another off day Thursday, before facing the Giants at home over the weekend. The Reds will begin a nine game West Coast road trip on Tuesday against the last place Arizona Diamondbacks (47-72). Stay tuned for a rundown before the series.